'Clearly, the Modi government is proving to be far more willing than any previous government in Delhi to hitch India's wagons with the US' regional strategies,' says Ambassador M K Bhadrakumar. The letter to Bharatiya Janata Party President Amit Shah by the party's 3-time MP Kirti Azad, questioning the move to initiate disciplinary action against him would have been, normally speaking, assured of media headlines, since it is invested with huge political symbolism. Shah derives his halo from Prime Minister Narendra Modi, but is no longer an awe-inspiring figure, and Azad is reputed to be a wily off-spinner. But Modi elbowed out Azad, hogging media headlines with his impulsive decision to 'drop by' in Lahore en route to Delhi from Kabul. How enduring would be Modi's achievement? A comparison between the Indian and Pakistani media is in order. The Indian media has gone euphoric, savouring the bits of information falling from the high table. But Pakistani dailies offer a study in contrast, exercising a due sense of proportions. The Pakistan foreign ministry statement was notably restrained and all but hinted at the hospitality that Lahore is famous for. The Indian establishment attributes entirely to Modi the credit for Friday's 'historic' happening -- as if a brilliant thought occured so very casually to our prime minister. The spin doctors scrambled to get the tale across. There are different versions as to how the Indian high commissioner managed to reach Lahore in time. Some say he chartered an aircraft and flew, others say he drove at breakneck speed in his Merc down the highway to Lahore. But senior Pakistani officials were not that lucky. Those who couldn't make it included Pakistan's Foreign Policy Advisor (and de facto foreign minister) Sartaj Aziz, National Security Advisor Lieutenant General Naseer Khan Janjua and the special assistant to the prime minister on foreign affairs, Syed Tariq Fatemi. None of the key figures in the Pakistani foreign and security policy establishment was present in Lahore. Indeed, we may have to wait for the next column by Jugnu Mohsin, publisher and editor of the Lahore-based Friday Times, to know what really transpired on Friday evening in the city. Perhaps, Washington knows something more than the Pakistani establishment or what the Indian spin doctors revealed. The comments in real time by the US State Department spokesman John Kirby that Modi's overture would 'benefit the entire region&' hits the nail on the head. The United States is appropriately casting Modi's bonhomie with Sharif against the grand backdrop of regional politics rather than vainly looking for substantive results in the India-Pakistan relationship. But Modi instead opted not to exercise that option. Run a fine comb through the India-Russia joint statement issued in Moscow or the text of the magnificent speech Modi made in Kabul at the inaugural of the Afghan parliament in Kabul, and it almost seems that he was acutely conscious of the importance of not causing embarrassment to Prime Minister Nawaz Sharif by harping on Pakistan's support of the Taliban, despite that being a major factor undermining regional security and stability. The Kabul speech, made just before Modi dialled Sharif's number in Lahore, is particularly conspicuous for its great reticence, notwithstanding the tsunami of anti-Pakistan sentiments sweeping over the Hindu Kush. Modi disappointed his Afghan audience by instead visualising Pakistan as a potential 'bridge' of regional cooperation between India and Afghanistan. Suffice it to say, Modi's tour hints at a major course correction by India. This is precisely what Kirby alluded to. The US has been exerting sustained pressure on India to normalise with Pakistan by rolling back its Great Game impulses on Afghan turf. And there is evidence, finally, that Modi is paying heed to Washington's wishes. His stopover in Lahore after a visit to Kabul by itself carried immense symbolism -- signalling that Delhi no longer harbours a zero-sum mindset over the Afghan situation. Hopefully, this policy shift will register not only on Sharif, but also on the GHQ of the Pakistani military in Rawalpindi. Rawalpindi has made India's perceived activities from Afghan soil as the litmus test of the Modi government's intentions toward Pakistan. Modi has now put his personal imprimatur on the policy shift. For Washington, on the other hand, India-Pakistan normalisation is highly desirable for the furtherance of its regional strategies in terms of the 'rebalance' in Asia and the containment policies toward Russia -- one may say it has become an imperative need. Clearly, the Modi government is proving to be far more willing than any previous government in Delhi to hitch India's wagons with the US' regional strategies. The Modi government has even begun flaunting this willingness, casting aside the lingering residues of strategic ambiguity, as is apparent from the huge upswing in the military cooperation and, most important, the near-certainty of acceding to the Pentagon's long-standing demand to conclude the Logistic Support Agreement, LSA, which would give free access for the US forces to Indian bases. The LSA is a force multiplier for the US in the region and the utility of the US-Indian congruence is simply seamless if the US chooses to confront China militarily anytime. The Indian establishment has begun selectively briefing the media lately with a view to sensitising public opinion that India is inching close to concluding the LSA, which signifies a paradigm shift in the country's policy of non-alignment and its adherence to strategic autonomy in a volatile regional and international mileu. Enter Pakistan. In order for US regional strategies to be effective, Pakistan's steady build-up as China's strategic partner needs to be arrested. And this is best done by reducing Pakistan's threat perceptions from India, which can only be achieved by persuading Delhi to abandon the Great Game in Afghanistan and improving the climate of relations with Islamabad. Can Washington swing this audacious attempt to bury India-Pakistan tensions? The good thing is that Modi is a willing torch-bearer and the ultra-nationalistic Sangh Parivar is in reality quite amenable to American influence. But is that enough? The point is, Modi and the Sangh Privar do not make even anywhere near one half of India. Again, Pakistan will forever continue to suspect that the leopard cannot change its spots. It is going to be a Herculean effort for Washington to shake up and loosen the tight Sino-Pakistan embrace. Make no mistake, China and Russia (and Iran) won't let go Pakistan and the Pakistani elites themselves know the relative worth of their country's strategic choices. Not only are there formidable backlogs of mutual suspicions and hardened mindset of mutual animosities on both sides of the flawed India-Pakistan relationship that need to be cleared (in systemic as well as in political terms), but Modi is no longer as strong as he used to be 19 months ago when he became prime minister. Meanwhile, Azad's letter to Shah testifies to gathering storms. Such a daredevil act by a BJP MP with political lineage from the Hindi heartland to question the judgment of his party leader whose real heft lies in him being Modi's Man Friday would have been unthinkable even a couple of months ago. It only shows that Shah no longer inspires shock and awe and the ground beneath his feet is shifting. Arguably, it is a reflection on Modi himself. 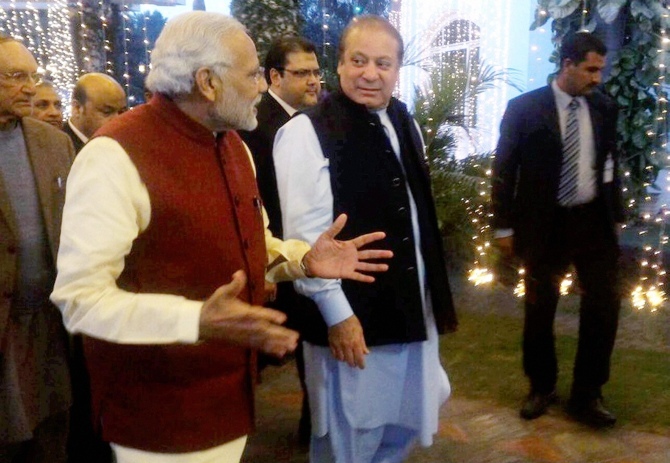 The problem with Modi's evening in Lahore is that it is a one-act play. It is a law of nature that hype becomes unsustainable for long once the climax is through. Whereas, Azad's letter is only Scene 1 of Act one in what may turn out to be a Five-Act Play. Ambassador M K Bhadrakumar is arguably India's leading expert on Afghanistan. Why did Modi switch planes in Moscow?